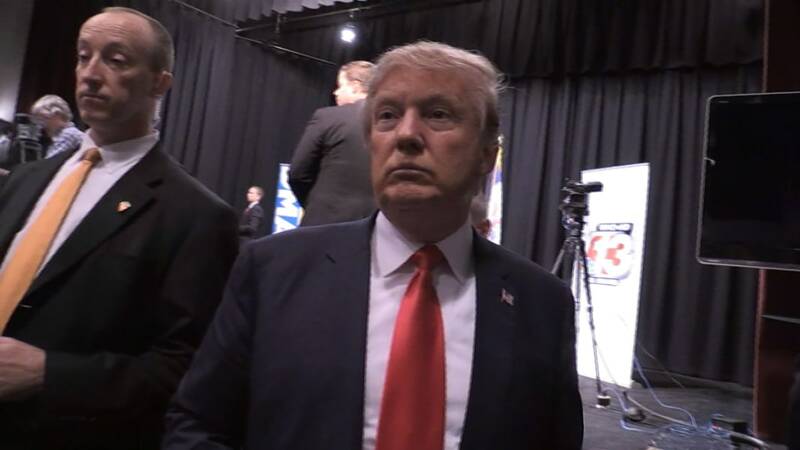 NEWTON, Iowa — Donald Trump "would certainly implement" a database system tracking Muslims in the United States, the Republican front-runner told NBC News on Thursday night. "I would certainly implement that. Absolutely," Trump said in Newton, Iowa, in between campaign town halls. When asked whether Muslims would be legally obligated to sign into the database, Trump responded, "They have to be — they have to be." On Friday morning, Trump rival Jeb Bush called the comments "just wrong." "You talk about internment, you talk about closing mosques, you talk about registering people. That's just wrong. I don't care about campaigns," he said on CNBC. "It's not a question of toughness. It's to manipulate people's angst and their fears. That's not strength, that's weakness." Hillary Clinton also denounced Trump's statement on Twitter. Ibrahim Hooper, national spokesman for the Council on American-Islamic Relations, sounded incredulous when he was asked about Trump's comments, telling NBC News: "We're kind of at a loss for words." "What else can you compare this to except to prewar Nazi Germany?" Hooper asked. "There's no other comparison, and [Trump] seems to think that's perfectly OK."
Rabbi Jack Moline, executive director of the nonprofit Interfaith Alliance, drew the same comparison Thursday night. "My father was in World War II, and he fought to preserve America against what the Nazis were doing," Moline told NBC News. "This is exactly why there is an America, to not be like that," he said. Trump was repeatedly asked to explain how his idea was different. Four times, he responded: "You tell me." He also ignored a question of whether there would be consequences for Muslims who do not register into the hypothetical database. Asked where they would be registered, the real estate mogul said Muslims would be signed up at "different places." "I't's all about management," he said. "Our country has no management." Trump tied his reasoning for the database to the need to identify who is in the country legally. "It would stop people from coming in illegally," Trump said. "We have to stop people from coming into our country illegally." During a town hall that aired just before making those remarks, Trump reiterated his calls not to allow Syrian refugees into the country, saying bringing them "into this country is suicide. I call it the Trojan horse." Ben Carson, currently second in recent national polling, suggested Thursday morning in Alabama that trying to distinguish terrorists among Syrian refugees coming into the United States would be like having "a rabid dog running around your neighborhood." "Doesn't mean that you hate all dogs, by any stretch of the imagination," Carson said. "But you're putting your intellect into motion and you're thinking how do I protect my children."